It's BFBN Guest Post Day and I'm really excited to be sharing a post from Val at Chronicles of a Babywise Mom about the father's role when bringing home a newborn. My husband actually gave me the idea to ask Val to write on this topic; he said it seems like it's mostly the women who do all the troubleshooting when it comes to dealing with a newborn (which I agree with!). 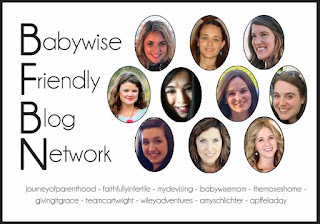 In fact, in the Babywise groups I'm in on Facebook (here and here) I've seen that it's exclusively the mom who takes on the roll of figuring out baby's feeding schedule, sleep needs, witching hour fixes, etc. So what can dad being doing to help mom? Val has some great suggestions below! When we came home from the hospital with our first child, my husband stood back and let me take full lead in what to do with our new little baby. While his confidence was inspiring, I didn't really know any better than he did. Luckily I am a quick study and figured things out relatively quickly. When our second child came along, he still hung back on the caretaking of the baby. He was very helpful with our now toddler, but didn't do much with the baby. This as a source of frustration for me. We later talked about it all, and he said he was always so unsure of what to do. He didn't want to get in the way or mess anything up with the baby. He didn't want to step on my toes and so he took a backseat and let me drive. Many dads find themselves in a similar situation. They are unsure of what they should do as a new dad. They wonder what their specific roles should be. 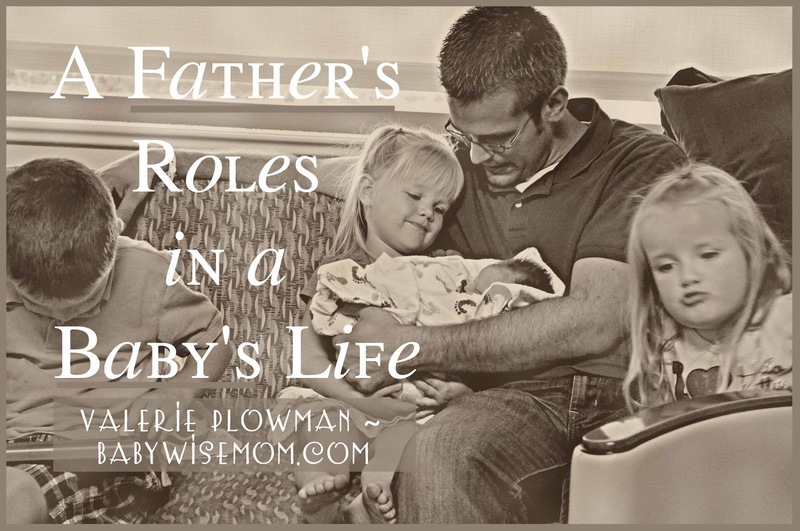 Here are some essential roles for dads to take on. You know women like to talk. Women don't just like it. Women need to talk. You need to be her informant and let her talk about all of the diapers, naps, yawns, and blinks of the day. Your wife will need to have some communication on an adult level even if it is still about baby things. Be her sounding board and confidant. Be her most trusted adviser. You also want to be such a good informant that you know the goals she is trying to accomplish with your new little baby. Know the how, but also the why. I can't see anything wrong with you reading the same parenting books she believes in. You can at least skim the book. If reading is too extremely painful for you, let your wife give you the cliff's notes version verbally. If you want to help your wife and child, you need to be on the same page. Why do you need to know the goals? So you can support! You can support her decisions. You can help her through the hard times and remind her why she is doing what she is doing. You can talk her down when she needs to be talked down. You can lift her up when she needs to be lifted. You can tell her to go away and take a bath, a nap, or whatever and you will be on baby duty when she is about to snap. As a supporter, you will also be trusting of your wife and what she inherently knows is best for your child. You should absolutely talk things out with her and consult with her on decisions (see informant section above). In the end, always remember that she is the nurturer. She will know what is best and sometimes just needs to talk it out or hear you say, "I agree with you!" to feel confident in moving forward. You know the saying, "You can't see the forest through the trees?" Having a baby is like that. You have strange hormones surging through your body and your mind is all consumed with that baby. Is the baby eating enough? Burping enough? Sleeping enough? Comfortable enough? Is the room dark enough? Is it too dark? Is she ruining the baby for life by some action right now? You need to keep your wife grounded to reality. Let her talk about the baby stuff, but talk to her about outside world things, also. Take her out of the house, even if it is just to go grocery shopping. When she leaves the house it will remind her how big the world is and how life keeps moving forward. Help your wife stay in touch with reality. A great way to support your wife in the early months is to do what you can to take over some household duties--or at least help with them. It can be hard to juggle getting to know a new baby and stay on top of meals and cleaning. If you aren't a cook, you could stop and get takeout on your way home every so often. Some men work a whole lot and would find it hard to fit in any duties at home. If this is you, consider hiring a cleaning service as a "new baby gift" for your wife for a few months. Don't sit back and wait for your wife to ask you to change a diaper or clothes. You don't need to be invited to do bathtime. You can step in and read a bedtime story. Offer to do these things. "My dear amazing wife, I would love to change the baby's diaper if you wouldn't mind." Doesn't that sound nice! Hehe. Offer to do these things even if your wife is an outspoken gal who always speaks her mind. I am one to not shy away from speaking my mind, but I am telling you that having a baby does things to you. You are a different person for a time. I can count on one hand the number of diapers my husband changed in the first six months. Did it bother me? Yes! Did I say something? No! He is naturally a very helpful person, so if he wasn't offering, I assumed he was not interested. He assumed I loved changing diapers and that I would say something if I felt otherwise. So offer your help. Also, don't be offended if the first few times you do these things, your wife follows behind and observes what is going on. I don't know if I can impress upon you what it feels like to carry a baby inside of you for 10 months and then just hand that baby over to someone else--even if that someone else is the father. It isn't that we think you inept. It isn't that we wouldn't love for you to change every diaper you are present for. It is just that we are being protective of our little baby. Delegating can be painful! Also, we love seeing the father of our child interact with our child. Sure, we would love to sneak away and use the bathroom or brush our teeth, but we love to see the interaction between our loved ones. One reason my husband felt hesitant in the beginning to do anything with our first born was that he was afraid he would do something wrong or somehow hurt him. A newborn is so tiny and looks so fragile. Babies are surprisingly resilient though! I still remember when my second child was born. She was in the NICU. I was burping her after a feeding and having a hard time getting results. A nurse came up and starting burping her. She just thumped and thumped on that baby's back! A NICU baby! But the baby was fine. Even I, as a mom with some experience, was afraid of hurting my baby and being overly cautious. Do not avoid holding your baby for fear of hurting the baby. Also, just as you should trust your wife and her nurturing ways, you should trust yourself and your unique role as a father. A mother is gentle. Fathers often do things like toss their baby into the air (not newborns of course...) and are in general just rougher with their children than the mother is. Children love it! Trust who you are and be who you are as a father. Do not try to be "mother the second." Be a father to your child. In the end, remember to be patient and loving to your wife and involved with your baby and you will get it right. Valerie is mother to four and blogs at www.babywisemom.com. The bonding in between a father and a baby is really awesome. It is the psychological thinking that mothers are very fond of their son and fathers are more likely to love their daughter. But the role of a father is really appreciable in their baby's life; a father is everything for his family and he act as the leader of the family take all responsibility on his shoulder. So we never skip the importance of a father in our life.